Meilee asked Santa for a Meccanoid G15 Personal Robot. It was not inexpensive, but when your Hello Kitty-loving, math-averse daughter asks for a programmable robot construction kit, it’s hard to say no. 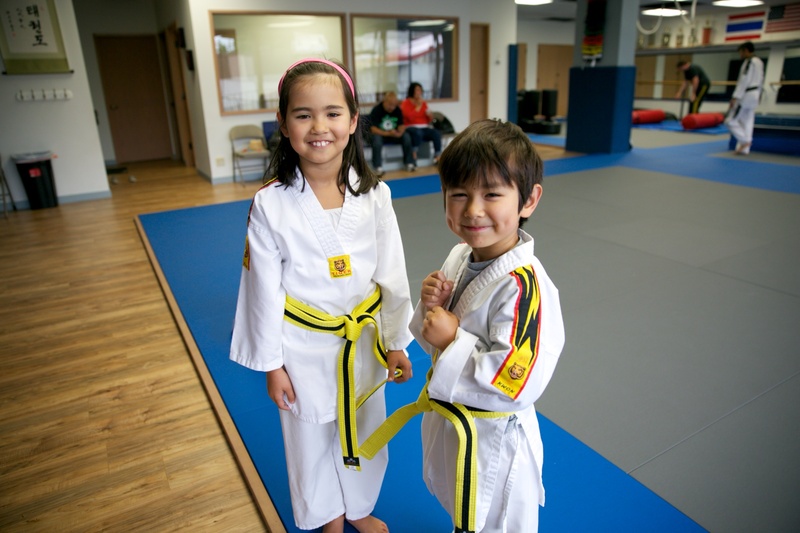 We try our best to bust gender stereotypes in our home, encouraging both kids to enjoy a range of activities and toys. Still, there is a blue-pink divide that persists. I did internal cartwheels when Meilee started talking about this robot. The construction required so much focus and I was heartened to see a project capture Meilee’s attention so deeply. Meilee started construction on Christmas Day and completed the first build a couple of days after that. There were robot parts all over the living room floor. Meilee watched several videos to help her with the construction. The look of satisfaction and joy. Doing “kung fu” with the robot. Tinkering with Robot’s arm. There would be much tinkering over the holiday break, because parts would come loose or she’d realize she installed a piece incorrectly. The sharp winter sunlight broke the gray and amplified the anticipation of Thanksgiving that pulsed through the air at the Sunday farmers market in Ballard, where there is usually one or a pair of poets who will write you a poem based on your choice of subject for whatever you choose to pay. I basked in the moment. My husband and I had left the kids at home with my mom, so that we could meander through the market and pop into some of the adjacent retail shops. A date at the Sunday farmers market. What a simple luxury. It was the perfect prelude to a poem – two poems. Normally, I’m task-oriented at the market. The kids have limited patience for shopping and after they’ve had their fresh mini doughnuts or their cups of fresh cider, they are done. So I don’t usually stop long enough for the sound of the typewriters in mid-stanza to sweep me up in their siren song. Free from a schedule, I approached @williamthepoet. I asked for two poems, one for Meilee and one for Shen. William took notes as I described each child. Meilee: She is creative and loves to draw. She’s a peacemaker who tries to solve conflicts among her peers. She bring light into a room. 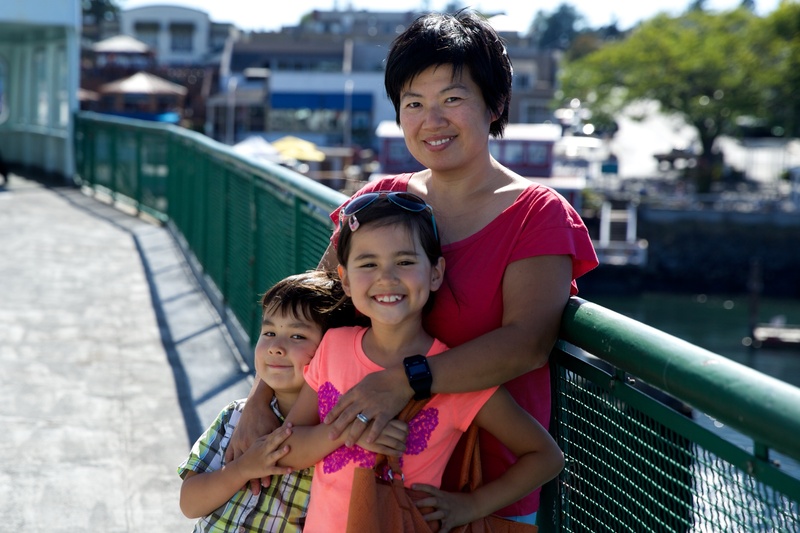 Shen: His name means “deep thinker.” He’s analytical, love Minecraft, LEGOs and engineering. He has dimples – which he calls “cute pits” – and knows how to use them. “Come back in about 20 minutes,” William said. This morning’s New York Times came packaged with a cardboard box. Inside the sleeve was a virtual reality viewer – branded with The New York Times, GE and Google. Of course. It blows my mind to think about what kind of work went into creating this gee-whiz, deceptively simple experience. 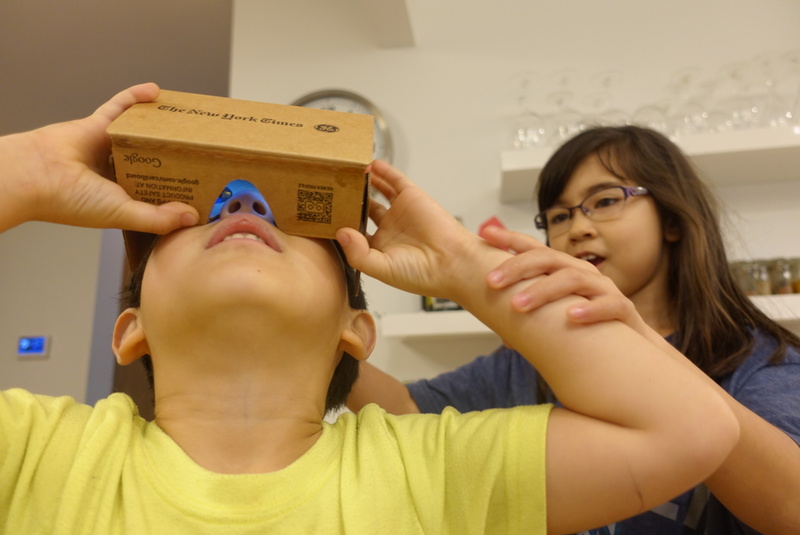 The kids immediately were curious about this box – which is called Google Cardboard. I had to download the nytvr app from iTunes and get the contraption set up, which didn’t take long. I made the video to record how the kids experienced the tool for the first time. 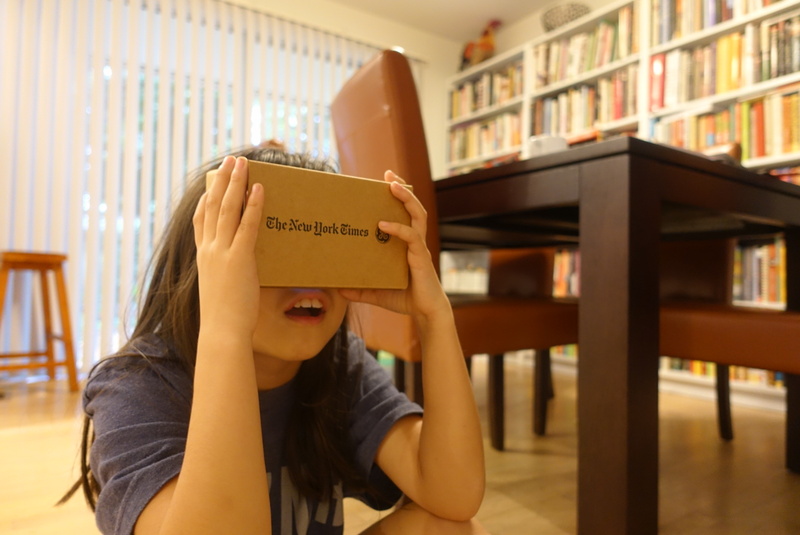 The VR videos on the NYT app are meant to accompany feature articles in today’s paper. 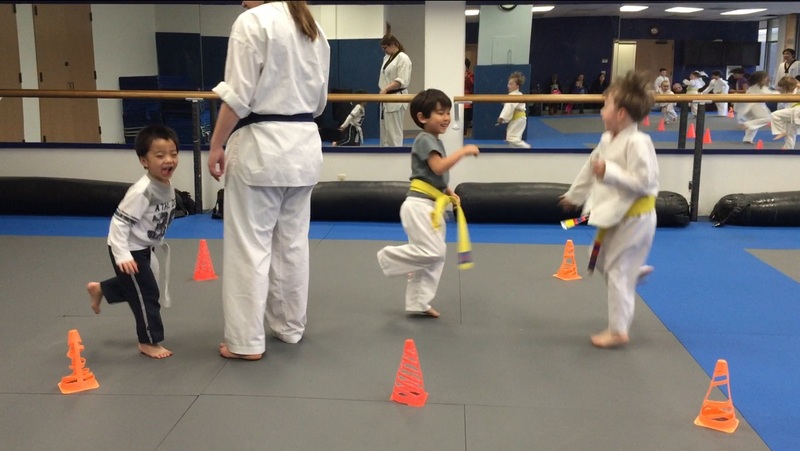 Meilee began learning how to use Scratch a year ago in July (read the original post). Her first published project was called The Unicorn Ghost and its premise was rudimentary: click on the button to make the unicorn move. She played around a little and started projects, but didn’t progress beyond one-trick ponies, so to speak. 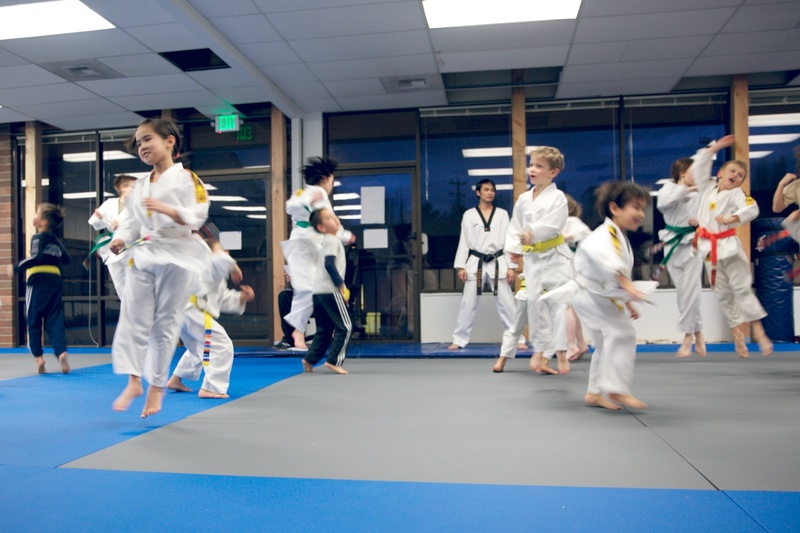 Recently, I saw an in article in Geewire.com about CoderDojo, a free weekly programming club for kids ages 8-18 that was founded in Seattle but now has local clubs across the country. 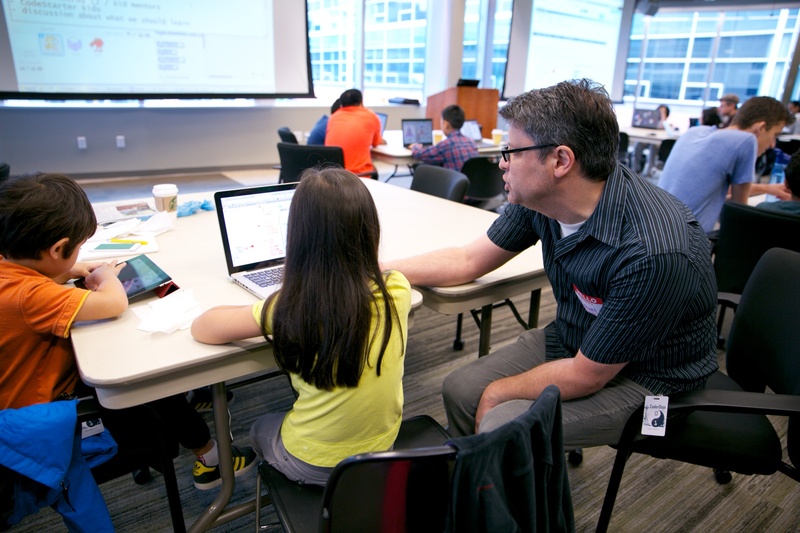 And the Seattle CoderDojo club meets on the Amazon campus – which is across the street from my office. 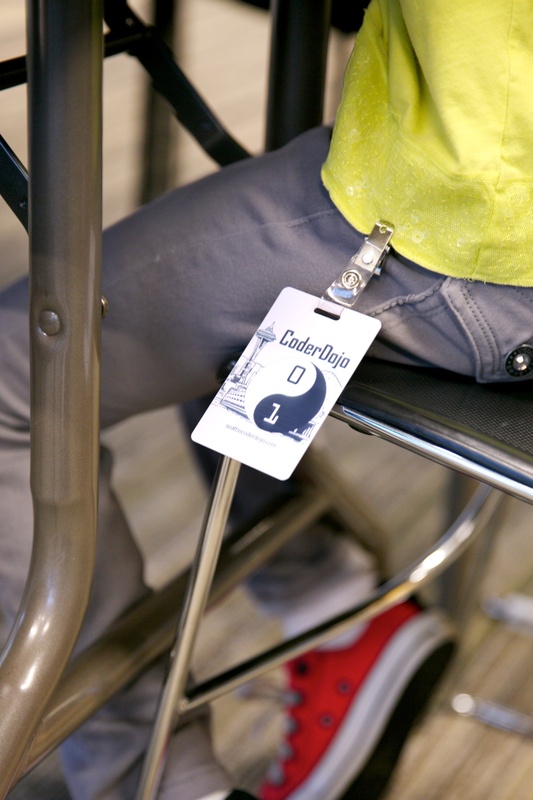 After we checked in at security, the kids were each given a souvenir CoderDojo badge, which was a great touch that made them feel official. 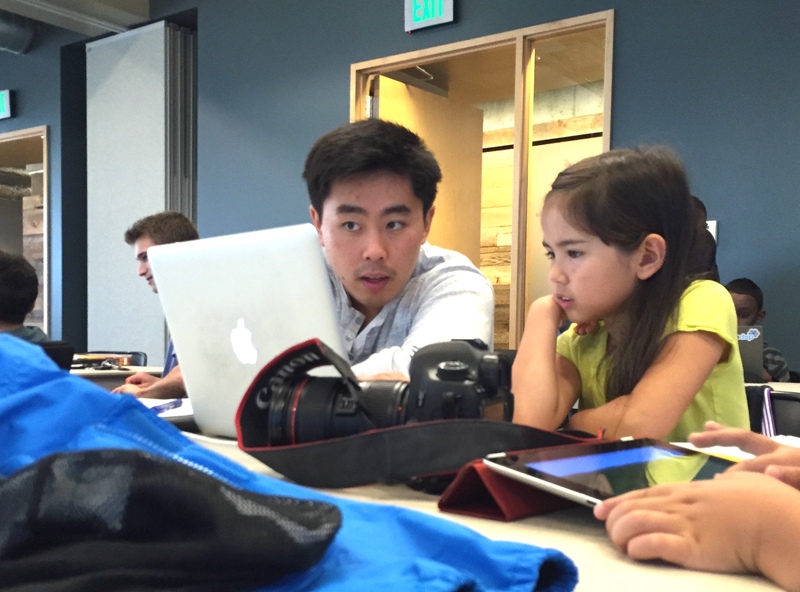 A Seattle CoderDojo mentor helps Meilee with a series of commands. Meilee’s first challenge was to use repeat loops to draw patterns with an arrow. Doing so required some thought as to what commands to use and some basic geometry. While the math was beyond Meilee’s experience, she was lucky that one of the volunteers happened to be a math teacher. A Seattle CoderDojo volunteer who happened to be a math teacher helped Meilee with some geometry. What appeals to me about CoderDojo is that it provides a place to go where Meilee can be around other kids who are interested in Scratch and where she can get expert help from mentors. 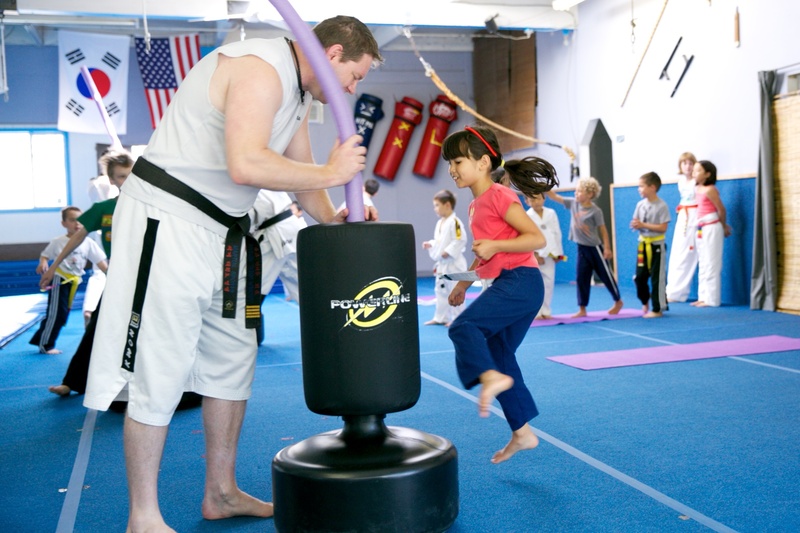 Best of all, the club is FREE (the magic word for DIY Tiger Mom) to attend. During a quick break, I ran into a woman in the restroom who said that the CoderDojo in New York had a waiting list of 500 kids. (500!) Luckily, that isn’t the case in Seattle. I had to ask my husband to take Meilee to the second session, because I had another appointment. Later in the day, she asked if she could show me what she learned at CoderDojo. It was so thrilling to hear her describe her thought process. As I mentioned in the post I wrote last year, I don’t necessarily want Meilee to become a software engineer. I just want her to learn how to analyze a challenge – regardless of what it is – and engineer a solution. I think she’s on her way. 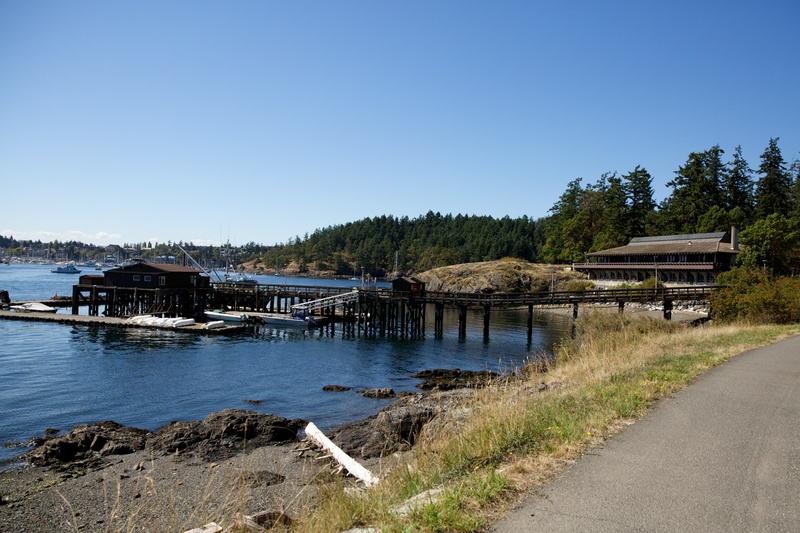 It’s the last week before the school year starts and we squeezed in one last summer field trip to Friday Harbor, where some of the scientists I work with at Institute for Systems Biology have been conducting research related to ocean acidification. 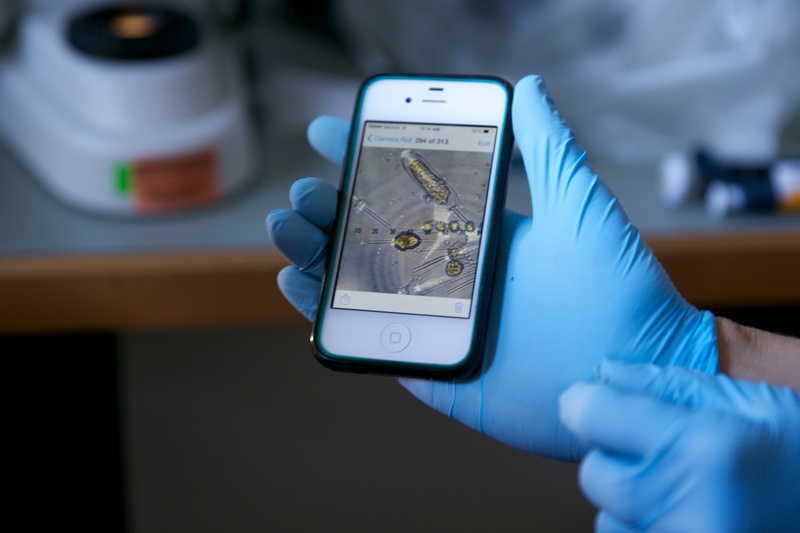 The Friday Harbor Labs belong to the University of Washington, but other researchers can rent the facilities, too. 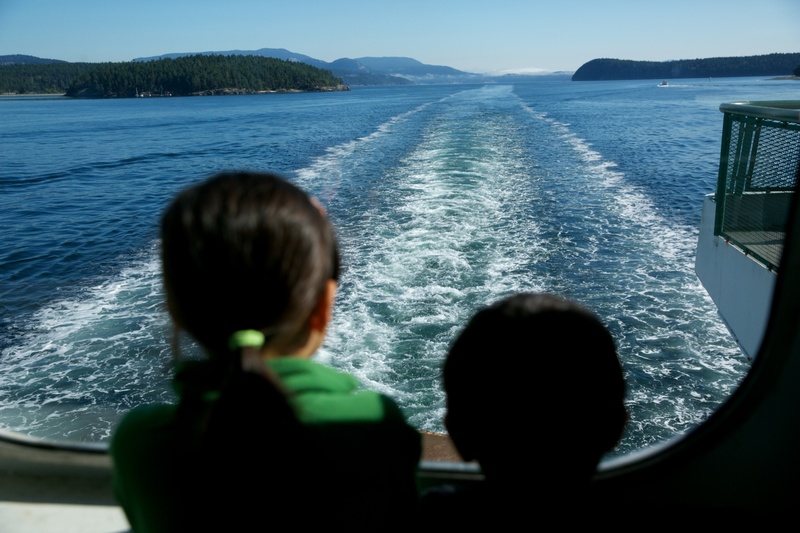 Getting to Friday Harbor on San Juan Island required a significant amount of patience from the kids: 2 hours to Anacortes, a short wait for the ferry, 1 hour on the ferry. 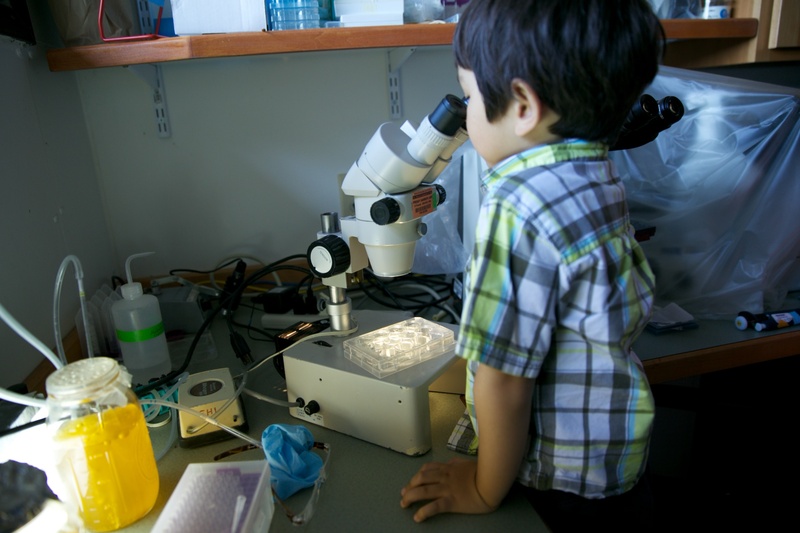 But once we arrived, there was plenty to see at the labs. 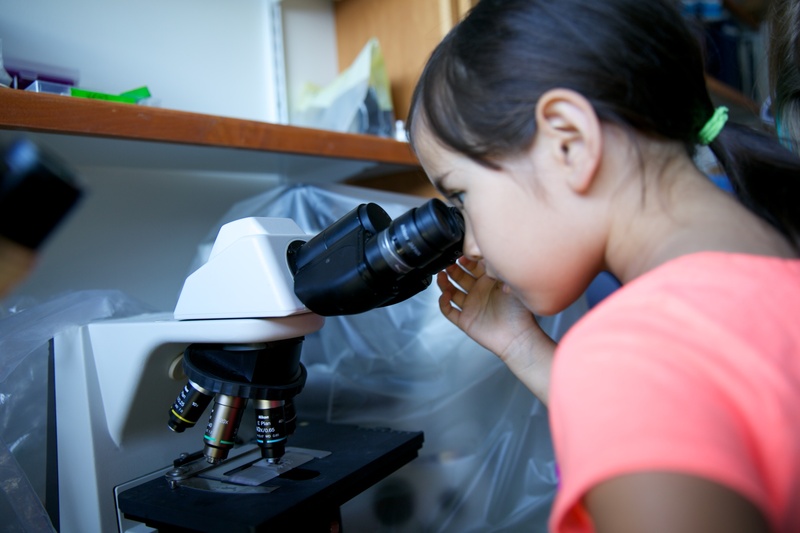 The kids got to peer into the microscope to see various phytoplankton, which are responsible for photosynthesis and play a key role in the food web in seawater and freshwater. 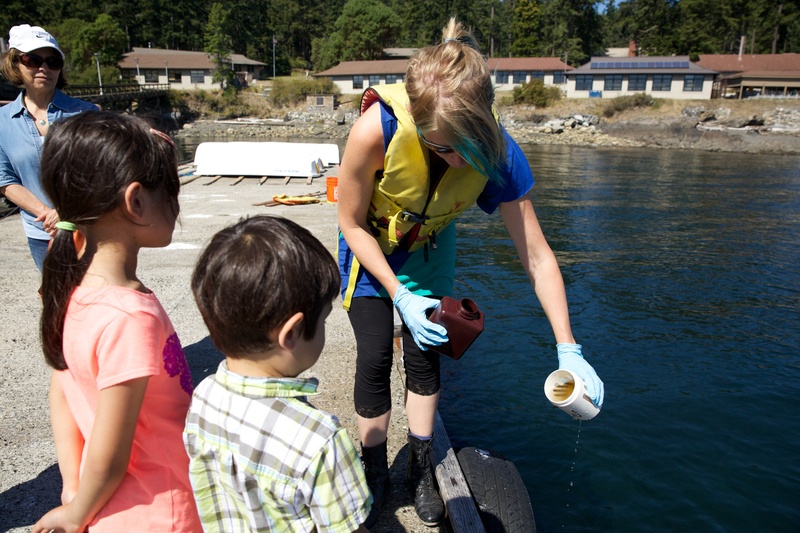 There are hundreds of types of phytoplankton, but the the sample the kids got to see primarily contained Thalassiosira, Coscinodiscus, Chaetoceros, and Ditylum, as well as zooplankton and larvae (e.g. sea urchin, jelly fish). 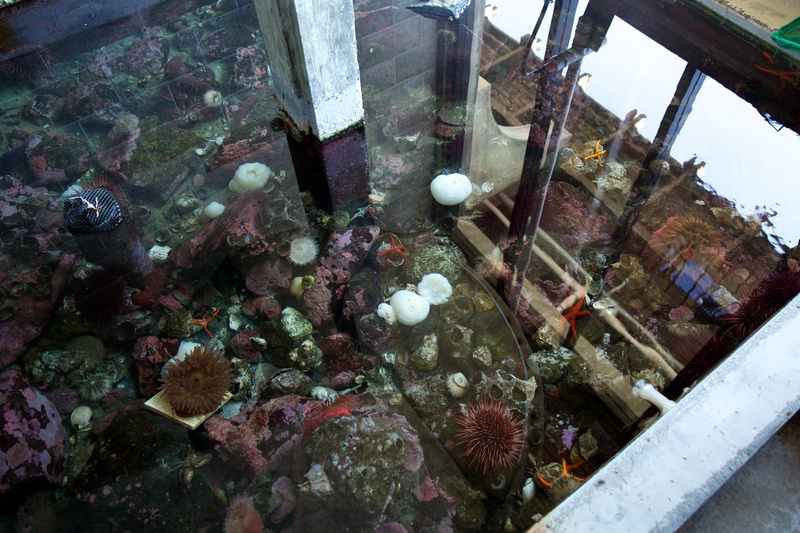 These organisms live in the waters just off the pier at the Friday Harbor Labs. 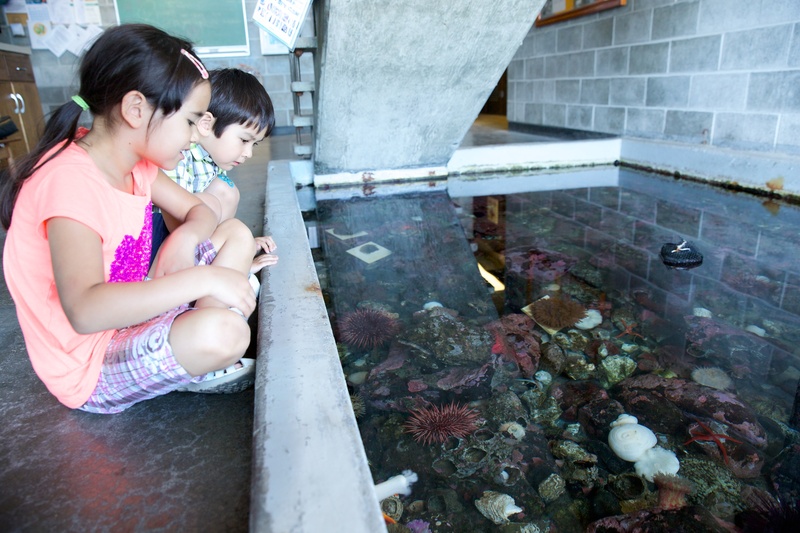 There is a small pool in the lobby of the main lab building, where visitors can see some of the creatures that live in the waters. 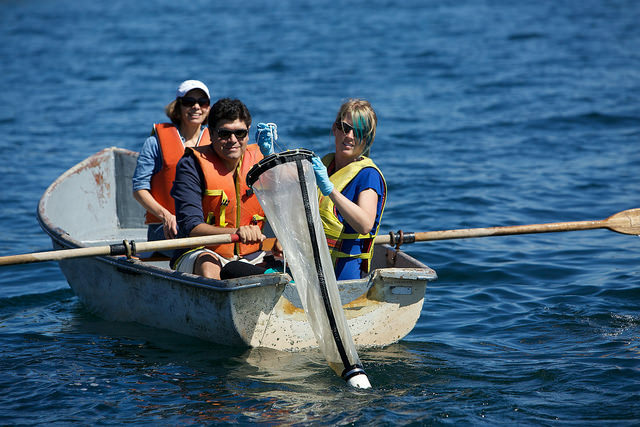 In the afternoon, the researchers (Monica Orellana, Allison Lee and Jake Valenzuela) took a row boat into the bay to collect water samples. 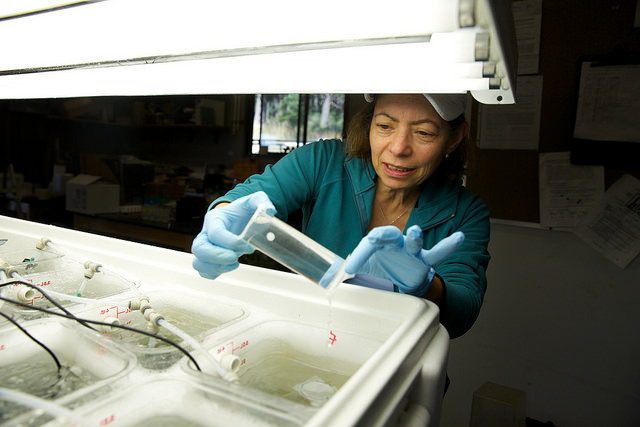 Allison is using a mesh phytoplankton net that concentrates the organisms in a cup-like container. 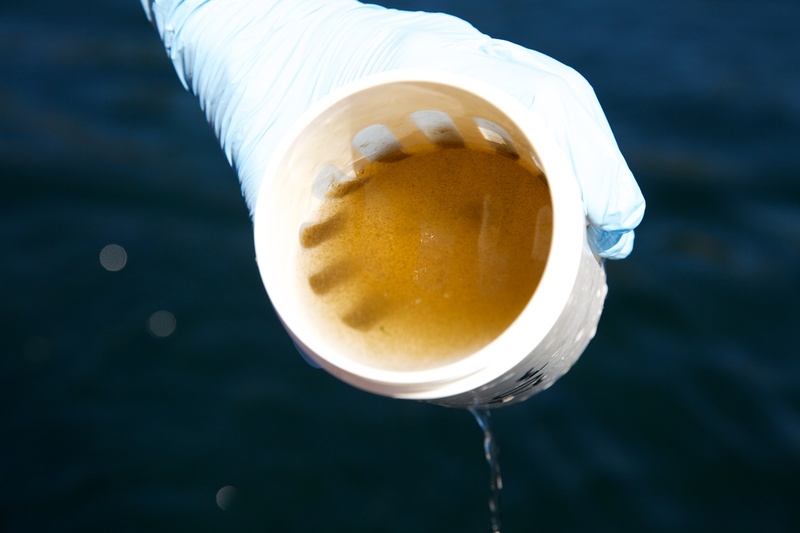 The reason the scientists were collecting samples was to be able to study how these organisms respond to different pH levels. It wasn’t all fun for the kids. Because I did have to do a little work, there were a few moments of down time when the kids got bored. I’m fortunate that I was able to bring the kids along on this trip. I don’t know what their minds retained from that day, but they can say that they went to the labs and looked into a microscope. 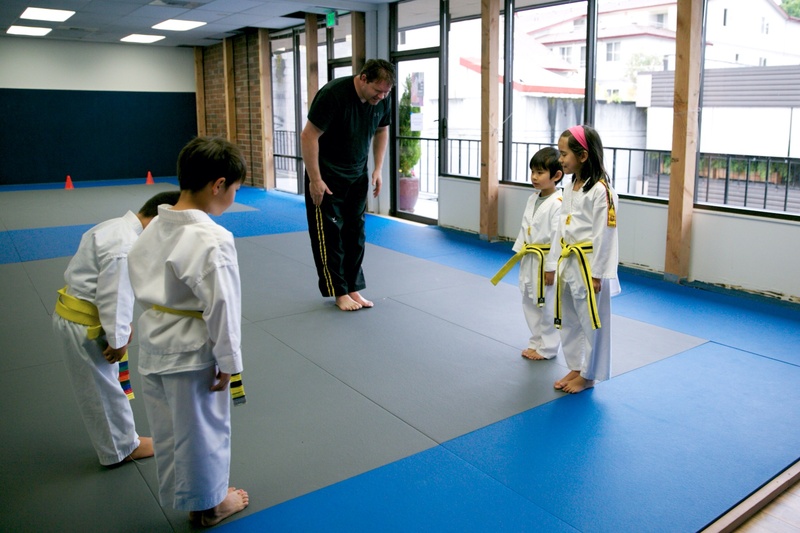 Sometimes, that’s all that it takes to inspire a kid.